Rabbit anti Canine, Guinea Pig, Human, Mouse, Porcine, Rabbit, Rat CISD2. 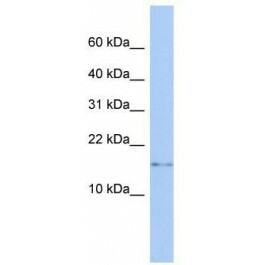 The immunogen for Anti-CISD2 Antibody: synthetic peptide directed towards the N terminal of human CISD2. Synthetic peptide located within the following region: VLESVARIVKVQLPAYLKRLPVPESITGFARLTVSEWLRLLPFLGVLALL. CISD2 is a zinc finger protein that localizes to the endoplasmic reticulum. It binds an iron/sulfur cluster and may be involved in calcium homeostasis. Defects in this gene are a cause of Wolfram syndrome 2 (WFS2).